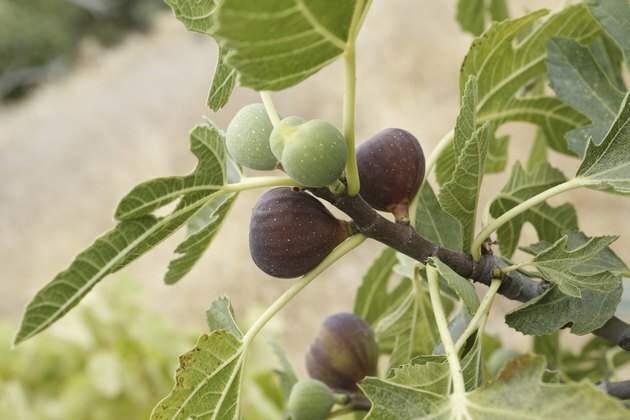 Fig trees are native to Asia, Australia or the Mediterranean, depending on the species, but several types have become naturalized to the United States. They are grown as ornamentals or house plants and some are naturally-occurring in the wild. The common fig is the most widely distributed fig tree type in the United States, but there are several other species you may encounter. When identifying fig trees, know that each species is evergreen but has broad leaves rather than coniferous needles. All fig trees also produce fruit, but some are more conspicuous than others. 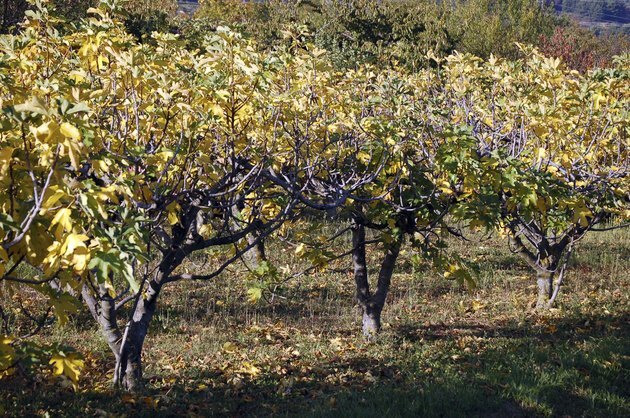 Fig trees growing in an orchard in autumn. Florida strangler fig plants growing outside in the sunshine. Identify fig trees based on where they are naturalized. 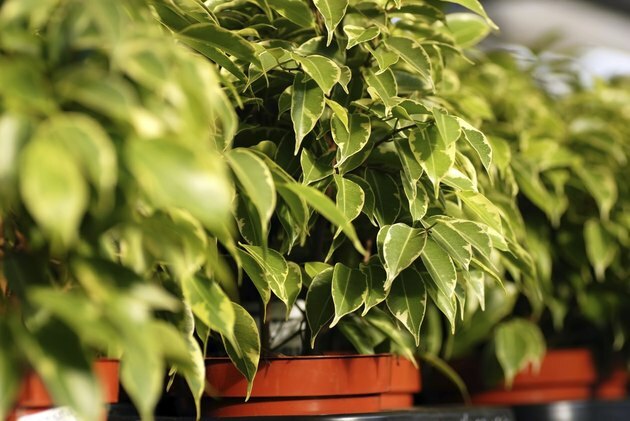 Generally, the Florida strangler fig (Ficus aurea) and the weeping fig (Ficus benjamina) are distributed in Florida. The Port Jackson fig, also called the rusty fig (Ficus rubiginosa), is distrubuted in California. 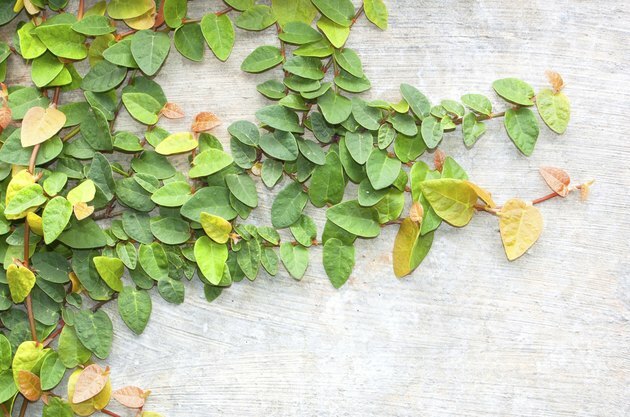 The climbing fig, also called the creeping fig (Ficus pumila), is found in the southern United States and the common fig (Ficus carica) is distributed in California and the southern, eastern and Great Lakes regions of the U.S.
Leaves of a creeping fig tree against a stone wall. Identify fig trees based on their leaf shape and sizes. Both the Florida strangler fig and the rusty fig have oval leaves with smooth edges but the Florida type's leaves are up to 8 inches long whereas the other species has approximately 4-inch long leaves. Weeping figs have oval leaves that are up to 4 inches long, but the edges are undulate, meaning they have dents and curves. Creeping figs have heart-shaped leaves that are approximately 1 inch long. Common fig leaves are particularly distinctive; they are up to 10 inches long and have three to five deeply-cut lobes. Purple figs growing on a common fig tree. Identify fig trees by looking at their fruit when mature. Florida strangler fig, weeping fig and rusty fig each produce small fruit that generally have a diameter no larger than 1/2 inch. These three species produce fruit with different colors, however, which are yellow, red and brown respectively. Climbing fig generate pear-shaped fruit that are purple and over 2-inches long when mature. 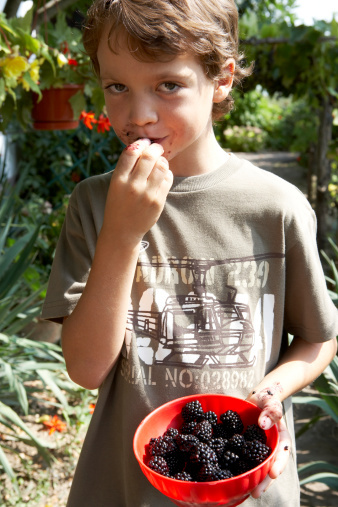 Common fig produces the showiest of fruits, which are spherical and purple to red when ripe. 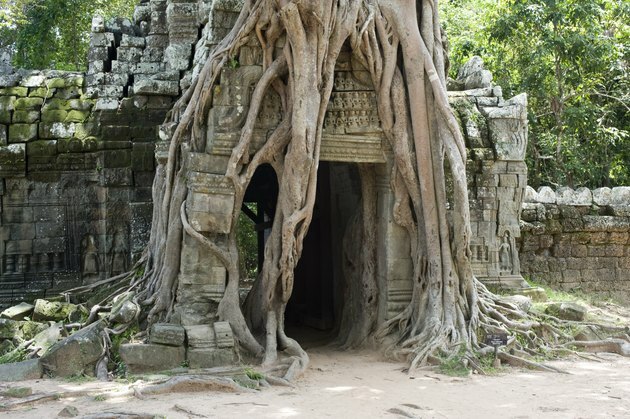 A strangler fig tree grows over the entrance of an ancient temple. Identify certain fig trees by distinctive growing forms. As the name suggests, a weeping fig's canopy is composed of drooping branches. Before the Florida strangler fig becomes an independent mature tree, it may be seen growing on another tree, with its grey branches twisting and strangling around its host. Creeping figs take on a vine rather than a tree appearance and climb walls and other vertical structures. When Will a Fig Tree Get Leaves?